Hi, my name is William DawnCloud (or for this particular guide Liam RainSpear). I have been playing this game since early 2009, however never really got into PvP all that much during the first age. Soon after the second age started I started to PvP… a lot. So much in fact that I started making characters strictly for PvP. This Myth was the first character I ever made strictly with PvP in mind. As I was leveling I really had no idea what level I should PvP at. I decided to stop at level 26 for a while and bring my character to at least knight. My record at level 26 was nothing to be proud of and I made it to knight with a record of 20-10. I soon started to level again and thought about stopping at level 35, where Myth seemed to be a power house due to Minotaur and Shatter. 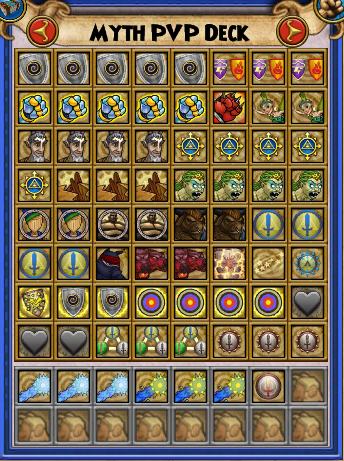 However I discarded that idea and kept questing, until I eventually reached level 50 and stopped questing for a while. I watch a lot of PvP matches and level 50 seemed like it could be perfect, but lack of crowns and a proper pet kept me from trying it. I stopped questing for quite a bit and during this time I still watched a lot of PvP. After a while I realized 60 was a perfect level for Myth. 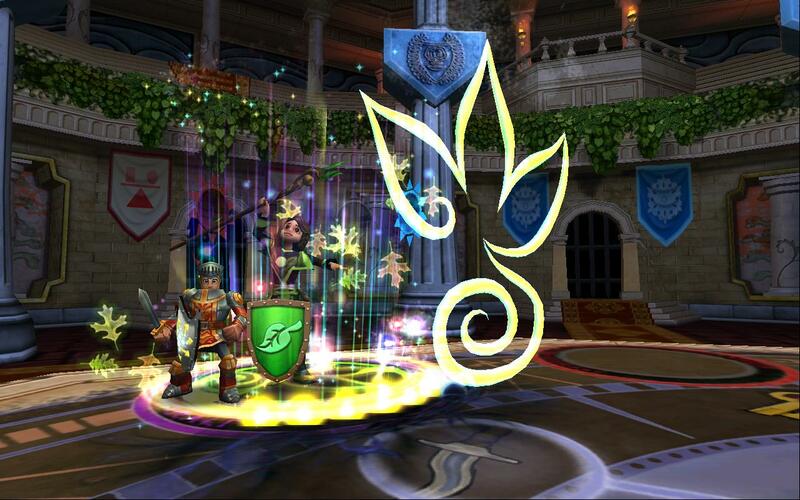 We receive good Waterworks gear and one of the best PvP spells of all time in Medusa. So I was on the road questing again. 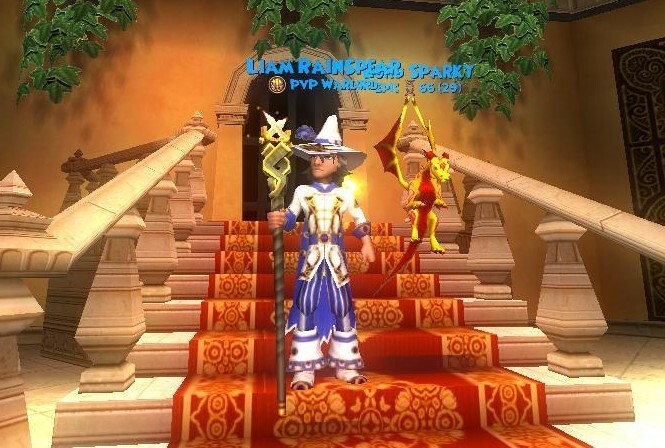 I finally got to level 60 and farmed Waterworks until I got the hat, boots, and robe (this wasn’t easy, Sylster doesn’t like me, but I did eventually get all of the gear). Level 60 PvP for me so far has been the most fun PvP I’ve ever played. So fun in fact that at this very moment I am leveling 2 characters simultaneously in order to have 3 characters at this level for PvP (characters are balance and death). 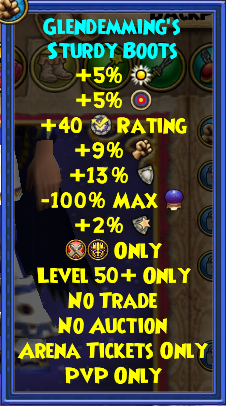 Level 60 PvP in my opinion is very fun partially because – other than a mastery amulet – all of the best gear at this level is either farmed or redeemed with arena tickets, not bought with crowns. Ok, let’s get right into things, I’ll start with training points. The gear chosen for this build was chosen with a tiered order of stats in mind; 1.Damage, Resist. 2. Health, Accuracy, Block, Power pips. 3. Critical, Healing boost. The Waterworks hat for Myth is hands down the best hat for this build. It adds good resist, decent damage, accuracy, some critical and a small chunk of health. Other hats that can work as substitutes are Poetic Chieftan’s Helm (crafted in Wintertusk) or Glendemming’s warlord hat. However, if you are serious about earning a higher rank, I would HIGHLY suggest farming Waterworks till you receive the hat (Glendemming’s second best option). The Waterworks robe is highly recommended for this build. Alternate choices are Glendemming’s robe and Chief’s Garb of Might. Use Glendemming’s if you cannot get Waterworks and use Chief’s Garb only if both are unavailable to you. If you are planning on reaching higher ranks, then Waterworks is preferred and Glendemming’s comes close behind. Before you are warlord I would suggest using the Tricksy Boots. However once you get to warlord and have the arena tickets, I use the Glendemming’s boots for enhanced block and significantly enhanced resist, in exchange for not much health loss. 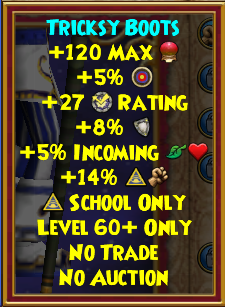 I use a life mastery amulet in this build. Pixie is one of my favorite cards to use with this and cheap Satyrs also come in handy. 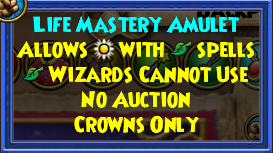 I use this over the balance mastery, because I did not find reshuffle is needed often with my training points. I carry it in my side deck instead, and it’s also also useful so I don’t have to carry all my heals in my side deck. I want to point out that the pet I used for the majority of my matches was quite bad actually, so to be honest anything with spell-proof and spell-defying will work just fine. 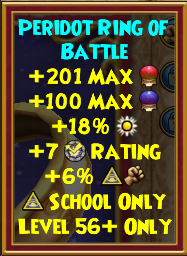 I used the flying squirrel until after hundred of hatches I FINALLY got a better pet, its only at epic at the moment but it has a very good chance of getting defy at mega, but… could also get spritely (hoping for defy). Generally speaking I am normally quite generous when it comes to pet hatching so if you happen to see me and would like to hatch, if I have the gold on me to do so there’s a very good chance I’ll say yes. In level 60 PvP there are several options for gear choices. The best ones include Waterworks gear and Glendemming’s Warlord gear from Diego. For the most part at level 60, people will use the Waterworks hat (because simply put; its better then the Glendemming’s hat) and will most often use the Glendemming’s boots (with the exception of maybe storm) because of the enhanced block and massively enhanced resist. They also add either accuracy and/or power pips to every school’s build in exchange for very little health loss but a slight loss in damage. The real reason I’m writing this potion of the guide is that – although the hat and boots are generally agreed upon – the robes are an entirely different story. I see it split about 50/50: half wear Glendemming’s and half wear Waterworks. I would like to explain why for this build (and in my opinion just about every build there is) the Waterworks robe is the better option. One of the biggest reasons why Waterworks is better is because of the health it gives. Glendemming’s gives no health at all while Waterworks gives anywhere from about 230 (I think for storm) up to about 520 for ice. 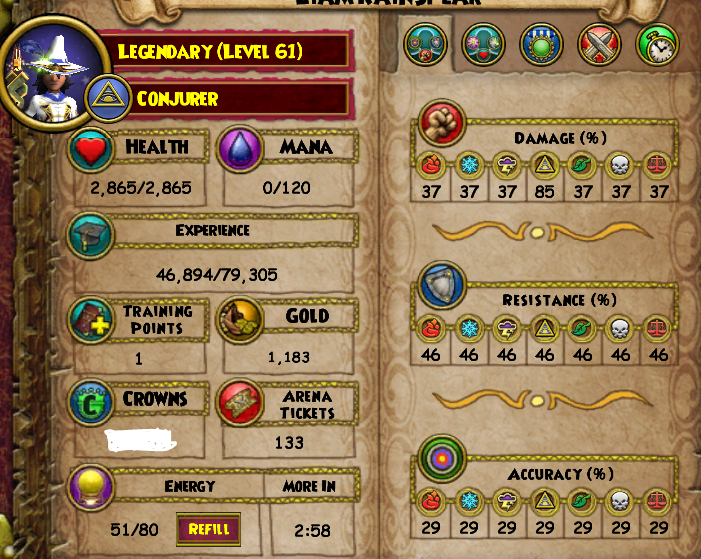 I believe that the extra resist will NEVER make up for the loss in health for the person because with the Waterworks Myth robe we get 350 health and I’m not gonna do the math for you but if you wanna see how much damage you’d need to take for 3 resist to make up for 350 health you can. Hint: it’s a lot. The Waterworks robes also receive more damage and add critical into the mix. The only place were Glendemming’s robe is better, is in the power pip for schools who receive accuracy from Waterworks, and accuracy for schools which receive power pip from Waterworks, as well as block enhanced by 2-4%. With that said: although the block is helpful and so is the power pip/accuracy, I do not see how it would ever make up for the loss in other stats. With this gear you should have the resist to survive quite well, while also being able to dish out serious damage when needed. Provides high damage boost mixed with above average resist. This build cannot fizzle without a mantle of some sort and with Infallible up you will almost never fizzle even with a mantle. I receive 2865 health which is normally plenty to survive harder hits. 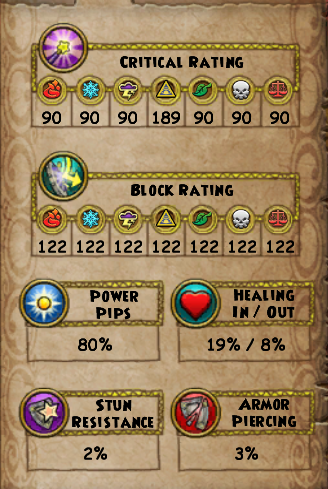 These stats were taken with full arena gear on and my newer damage pet. 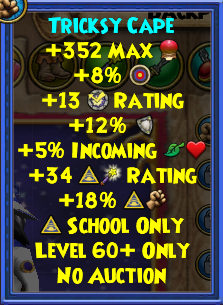 If this pet gets spell-defying at mega, my resist will be bumped to 51. 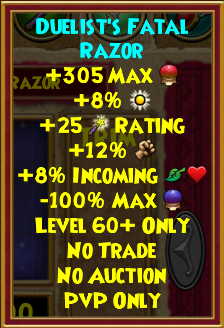 Note that without the arena gear and damage pet my resist is bumped to 50 but my damage is massively lowered to 54. Note: Just because I chose to take the pictures with my improved stats does not mean that is what I used throughout. I managed to make it to rank 1400 without full arena gear and the flying squirrel pet with a very good record. 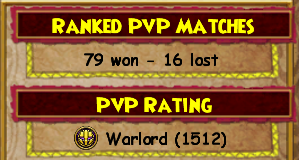 I had only lost twice during warlord (which remains true) and I was having relative ease with my matches even with worse gear and pet. Next is my deck setup. It usually takes me a few tries to get a deck correct (mainly cause when I’m first making a deck I get excited and go WAY overboard with some cards lol). This is the deck I used once I finally put together one that suited me. I’ve used this same deck and it has worked very well for me throughout the entire time I’ve PvPed on this character. It contains enough enchants and attacks to finish off an opponent without going into the side deck. It also provides debuffs and many other miscellaneous spells such as heals, bubbles, minions and auras. The side deck is massively important to this build. I have essential cards which are set up to where I could single handedly play out of my side deck and still pull off the victory if needed. It provides several Medusa – which is a key spell to any Myth over level 58 – as well as several other big hits such as Orthrus, Minotaur, and Ninja Pigs. It provides enchanted trolls as very effective finishers. It provides Infallible for getting our combo ready and, last but certainly not least, it provides us with effective defensive cards in Weakness and Tower Shield, which we can draw for in case of emergency or as a waiting move. It also provides triage in case of strong DoTs that we desperately need to get rid of. In truth, I have only used one triage ever on this character, but had I not, there was no way I would have won that match. So I still keep them in as they are important to stay alive when needed. MAIN DECK: Tower Shield is in as our only defense to Balance as well as a general defense to all schools. Volcanic shields are in to survive against Storm and are a great help against Fire. Enchants are there for obvious reasons. Pixie and Satyr are our heals. It has five bubbles to keep semi competitive in the bubble war. Three Earthquakes to double as blade stack counter and minion killer. Four Medusa, our main hit and favorite combo starter. Two Golem minions to keep opponents’ shields down. Two Talos to deal serious damage to the opponent, keep them occupied, and kill opposing minions. Two main deck Minotaur and Orthrus to hit for solid almost unavoidable damage. Four Myth blades and 3 Spirit blades to increase damage output. One Ninja pig to deal serious damage for low pip cost. One Shatter in case of shield spammers. One Stun as a waiting move, to break a Stun Block or to start the deadly Medusa Stun Medusa combo. One Myth dispel to use against people running Myth mastery or Shatter strategy as well as can be helpful against other Myth. One conviction to stun resist as well as help block any criticals. Two Fortify to counter a DoT or to eliminate the other person’s Infallible. Four Infallible to help create massive damage spikes. Three Infections to reduce healing and three Weaknesses to reduce damage particularly on damage over-times. SIDE DECK: The side deck of this build has worked truly amazingly for me as it has everything needed to win a match contained within. 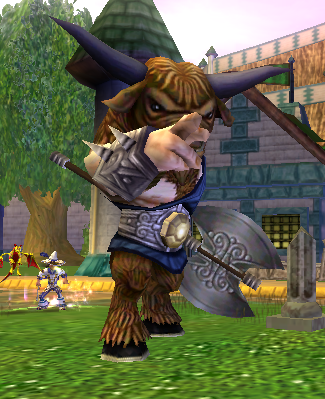 The attacks are enchanted with Gargantuan TC which can be bought from the Archivist in Celestia for 500 gold a pop. It contains attacks easily capable of finishing an opponent, trolls as finishers, defensive spells like Tower, Triage, and Weakness and has two reshuffle for when needed. Some spells fade overtime in overall use of the spell. For example, when would a minion be more useful: to a level 30 who can keep a minion alive for some time or a level 100 where, if the minion stays alive for more then 3 turns, the opponent has done something wrong? Well here are some spells that many people seem to forget about as you level up and I’m going to explain why each of these spells is so important to the build. Pixie: This is hands down my favorite heal. For only one power pip you’re going to get back 400-700 health depending on your heal boost. For this build, we will get about 550. 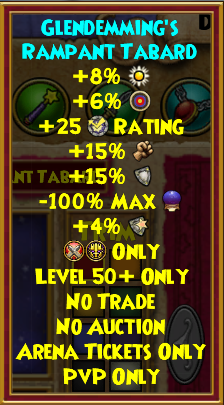 This spell is GREAT to use when you have health in the ranges of 1600-2300, in order to get your health back up and cancel out any attack that you may have been hit with recently. Fortify: This spell has true value in this build and when it does appear (along with stun) it is a card I rarely discard. The best use for this card is when the opponent uses Infallible. This spell will completely cancel it out, letting you resist most of the attack still. Another great use is when you are predicting a DoT but don’t have a Weakness in hand, you can use this and make the DoT much less powerful. Orthrus: Many Myths seem to forget about this spell as they level up, but I’m here to say that if you neglect this spell then you are making a terrible decision. 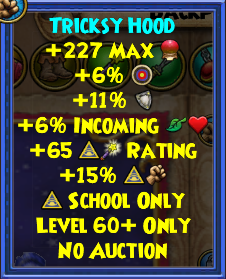 This spell, as most of you know, hits twice so it is arguably the most, or one of the most, reliable hits in the game. Particularly from second, where the opponent can put up an untimely shield to try to destroy your attack. When going second, the moment a Stun Block goes up this becomes your go to spell. A bladed Orthrus with Infallible and a bubble will do a lot of damage no matter if you’re second or first. Stun: I only carry one stun in my deck but when it does show up I generally like to hold onto it. Stun can help us remove a stun block in order to get off a successful Medusa or it can buy us time if we need to. 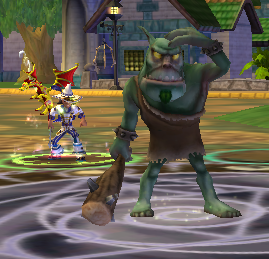 It can also help us start one of the most deadly combos in all of wizard 101… Medusa>Stun>Medusa>Other. Sounds crazy right? Well there is a guide written focused around that strategy and highlights how it can be effective at any level. For the most part this strategy is based around comboing your opponent and, by doing so, not allowing your opponent to react quick enough to counter it. I’ll break it down into specific portions of the strategy. This is where you want to get a feel for your opponent. The first thing you should do is check your opponent’s school. This should tell you quite a bit on how they play. In the early stages of the match you should start using gradual debuffs intermingled with blades, auras, and infects. This stage is likely to last the longest. If your opponent seems to be the defensive type, I’d suggest sending out either Talos or Golem. Either one works, however if your opponent goes on the offensive right away, you should only use minions strategically and when the situation is right, because you will need those turns to shield or Weakness etc. If your opponent is getting too high on blades or shields, you should throw out an occasional Earthquake to destroy their attacks. You should also consider putting a bubble up. I carry 5 bubbles in order to win the bubble war. Most of the time however don’t push the bubble war too much. For example, if my opponent is ice, I generally don’t bubble till they do, because you don’t wanna push the bubble war on them unless you have to. Also be smart about your bubble. If you’re not ready to attack soon and your opponent has their bubble up but is not currently posing a threat, then wait a little while before replacing their bubble with your own. In an active bubble war, replacing a person’s bubble too early will just make them put their bubble back up and nothing was gained. Once you’re just about ready to attack though, put your bubble up. Once you are well protected, you should think about starting your combo. You should have several blades on by now and preferably more than one Myth/Spirit blade. Before starting the combo, check for certain things that could mess you up. For example, if you are going second to a fire or a high level death, then you should check their pips and assess if you believe they might Efreet or Bad Juju in said situation. Sometimes your gut feeling is saying that the opponent will not Efreet. For example, say you have a volcanic and a tower shield mixed. Your opponent will be much less likely to be willing to dump 8 pips into an attack that would only do about 200 through those shields. However, if they have low pips, I’d suggest you start your combo before they can do anything about it. Before starting your combo against just about 95% of opponents, put Infallible up. This will help you create a massive damage spike, while just about never having to worry about fizzling (base accuracy 29+15 or 20%). My favorite spell to start a combo is… you guessed it, Medusa. Assuming they have no stun blocks, Medusa is your go to spell from first and second. Don’t be afraid to hit a Medusa into a shield from second, the two round stun will give you plenty of time to recover. After you hit with a Medusa, you’ll want to use whatever is the best option in that situation. This deck and strategy are very flexible and allow for many different kill options. If the situation calls for it, you could Medusa again, Ninja Pig, Minotaur, Orthrus and Troll – all depending on your pips and the cards available to you at that moment. If your opponent has a stun block on, then Orthrus becomes your go to spell. A multi-bladed Orthrus with Infallible and a bubble will do a lot of damage. Once your opponent is close to dead, or at about half health, you want to try to kill them before they get a chance to heal. Hopefully they have at least one infection on, but if they don’t, then don’t worry about it too badly. If you still have Infallible up this will help a lot. Often times I find that the enchanted Trolls in the side deck are the best options as finishers if your higher pip spells did not kill the opponent. With a 58% damage boost (what I had with pet#1) a Troll with Infallible up will do anywhere from 500-700 damage to the opponent, which can generate the damage we need to finish out a match. With better damage the Trolls you will obviously do a bit more. Hopefully you have done everything right and have closed out the match effectively, giving you the victory. What should I do when facing a lower level Glendemming’s warlord? Many people enjoy level 50 PvP primarily because of the excellent gear that is given at that level from Diego. This has led to over half of the leader-boards being people from level 50-56 so you will face these people often. Once you get to a higher rank you will start facing many of the people in this level that are on or near the leaderboards. To be honest, these are almost always easy matches (I’ve only lost once to any level 50-56 warlord and it was because the 9% stun resist on their gear worked). The key to these matches is to take advantage of their significantly lower health. If Glendemming’s gear has one true flaw, it is that it gives no health at all. I cannot stress enough how important it is to take advatage of their low health. From first an unbladed Medusa under Infallible will take away about half of their health. You can then follow up with any attack and/or blade, and then finish them off. From second, things get a tad more difficult but not by too much. Medusa is still effective, as it will hit for 500 through a shield, leaving them with a max of 2000 health left, which is generally no problem with Infallible up. However, you should still set up an attack and BUILD PIPS. The more pips you have, the easier it will be to take them out. Often times I like to put up Talos in these fights as their enchantments are limited and Talos can wreak havoc on their lower health as well as kill any minions they put up, with Talos frequently using Humongofrog. All in all, you want to keep yourself defended against these guys, while blading up and then unleash a combo. And don’t forget they will not have as much health as you, so take advantage of that! The people you will be facing will normally have 55 resist so make sure to attack with Infallible up, as this will drastically increase your damage. In the case that the opponent has a stun block and/or Myth specific shields on, then my preferred combo starts with a multi-bladed Orthrus with Infallible up. As I’ve mentioned before, level 50 warlords have rather low health, so this will take out at the minimum half of their health and most likely quite a bit more. If they have an infection on, then it will be tough for them to heal off the orthrus’ damage and then you will be able to finish them off. How about higher level opponents? This should be a different approach from the Glendemming’s warlords. These people will normally have an abundance of health, however they will likely have lower resist. The school of these people will determine your tempo. Get at least one blade and your bubble up, then put Infallible up and blast them with a Medusa. This, if unshielded, should do around 2500-3200 damage. They will then need to pass, allowing you to get any other attacks off to finish off the match. Against these people make sure you debuff them, and do it often. You don’t want to give them a open hit, especially when they are at much higher levels. Once you start encountering Shrike, Medusa really shines. Make them regret using shrike and otherwise play the same as you would against any other higher level. Debuff a lot and then start your combo like you would in any other match. Storm is relatively easy to defeat as a Myth. Our deck allows us to use several storm specific shields. I STRONGLY suggest using these. Against storm you generally want to debuff a lot, but make sure you leave yourself time to get a blade in if you can and Infallible up. You should start your combo quicker than you would against a normal school and I normally use Medusa against them earlier, say at 10 pips vs 12 or 14. They will have low health and likely lower resist, so one Medusa and a finisher is usually enough to close out the match. Watch out for Insane Bolt when there health is low and be wary of Wild Bolt, as both of those spells can change the tempo of a match very quickly. Fire is a school which I have a lot of experience with, as my original character is a fire. At level 60, the fire school has a lot of leverage and it shows on the leaderboards. This will be one of your more tricky matches, especially from second. One spell that deserves special attention is Power Link. 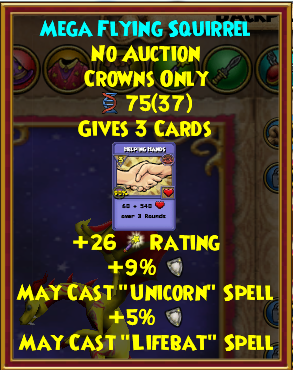 This spell is amazing depending on their heal boost and critical. It can heal them back for quite a bit, as well as deal some decent damage to us. Always count a fire’s pips and try to avoid starting your combo if they have 8 or more pips, because Efreet can completely destroy an attack, while dealing good damage to you. I prefer Weakness against fire, however do not neglect shields. Having a shield up will hopefully discourage them from using Efreet, and even if they do, it will prevent a large chunk of the damage spells like Efreet and Helephant can do. Once again, you should blade up while sending a steady stream of debuffs and then, when you’re ready, infall and start your combo. 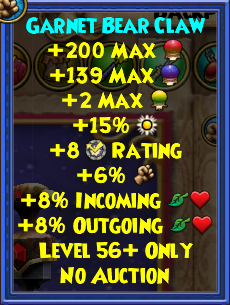 Ice can be tough, they have massive health and high resist. What you want to do against an ice is play a little slower. Debuff a lot, as usual, while blading yourself up. I like to send Talos out against ice. If they are shielding, send out golem minion and then when they kill it, send Talos and/or another golem minion to replace it. Try to be annoying with a mixture of Talos and golem minion. Against ice one of myths trademark spells becomes evry useful. It’s a spell that I have not mentioned often yet: Earthquake. Use Earthquake if they are stacking too many blades and shields. As long as they don’t have blades, the base damage of their spells is generally too low to take us out and we can easily heal off the damage with pixie and Satyr. If they Infallible, then throw up a fortify. Once you’ve built up blades and pips, it’s time to start your combo. 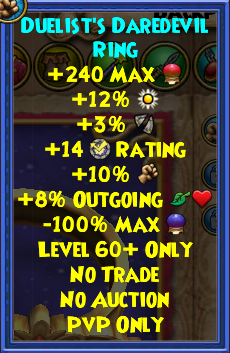 I like Orthrus against ice a lot more than I do in an average fight for whatever reason. Mainly from second, because if they shield, this is the only school we may not be able to kill with our combo. Make sure to infect them often, so they can’t heal off our damage. Once you’ve gotten them into the red zone, depending on the situation and their health, use Minotaur, Ninja Pigs, Troll etc to finish them off. Death is one of the most common schools you’ll face (at least for me it is). These matches are pretty simple. Make sure they have a Weakness on, because Skeletal Dragon can be deadly. If they Infallible, you should fortify. Look out for drain spells though, so never leave yourself wide open for a hit. Generally be careful with minions as their drain spells can make you regret sending them out. If they Doom, either switch it back, or make them pay for using it by swarming them with attacks they cannot heal off. Otherwise, stick to the strategy and blade up then Infallible and start your combo. Life is actually one of the tougher schools for this build and caused me problems till I got used to how to play on Myth effectively. Most of the life people you will face will have gnomes and this is the major reason why. Take advantage of them not having a DoT and shield a lot. If they blade too much, use Earthquake. If you find your Myth dispel, it is never a bad idea to use it because life will often run a Myth mastery build. Stick to the strategy and blade up, then start your combo. However, because of gnomes, you’ll likely have limited healing so you generally want to play a bit faster against them. You will be able to out-damage them just about every time. Try to limit their healing as best you can. 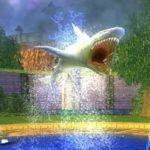 Do not let Sanctuary stay up and switch it to time of legend A.S.A.P. Medusa is very effective, because it limits their healing for the turns they are stunned. Otherwise, blade quickly, build pips, Infallible and unleash your combo. Don’t forget, as much as I write I will never truly be able to tell you everything. A lot of knowing what to do in these matches comes from experience in the arena. After a while, you will begin to develop a feel for how you play, allowing you to take full advantage of this setup or any others you may try. I cannot tell you how many times I have witnessed poor sportsmanship in the arena. We all get frustrated sometimes, but you should never go too far with it. If you defeat a higher level opponent, don’t be mean to them and call them a noob. That’s mean and it could hurt their feelings. Instead say gg and maybe talk to them for a bit and tell them what you think they could do better next time. This is what I do often times and it has gotten me a lot of respect among several other players. One thing that you should take into consideration is that everyone who has ever played this game or stepped foot in the arena was a noob at one point. So just because you’re an experienced player, does not give you the right to insult a person who has not been playing for as long as you or maybe hasn’t grasped the concepts of PvP quite as quickly. I’m not going to tell you you can’t be a little upset after a match, by all means that’s fine. Just don’t take things too far in your comments after a frustrating match. (The farthest I’ve gone was after I faced a jade juju spammer for the first time and that got me very mad lol. But most importantly, if you’re not having fun, then I suggest you step out of the arena. There is no point to PvP if you aren’t having fun. PvP isn’t meant to be boring, so try your best to have as much fun as possible but make sure you help others have an enjoyable experience in the process too. How Successful Have I Been With This Strategy? So far I have been very successful with this build. If you read the paragraph about the character above, you’d know that as a level 26 I went 20-10 so my real record with this build is 59-6. During my time as a warlord I have only lost twice overall. 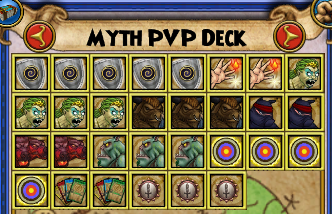 Three of the other losses were early on, when I was still getting a feel for level 60 PvP on Myth. And the last one was as I was going up to click on my friends list to talk to a few of them but I accidentally clicked the exit button so it counted as a flee. (I was so upset when it happened but now I think it’s kinda funny in an unfortunate way lol). My most recent loss was in the early 1200’s in rank (I think, might have been a bit earlier even). I will keep you guys posted on my current rank in the comments section. This set-up was built to be able to be adaptable to almost every style of play and is capable of picking up the pace or slowing it down. We have enough defensive cards and attacks to sustain a long match as well as the potency in our attacks to spike massive damage with few pips. This build was intended to be taken to ranks well over 1000 and I will keep pvping with this build for quite some time. As with every guide, this guide has several weaknesses. However, they are strongly outweighed by the strengths and are easily overcome with the right mindset and PvP skill. This deck’s primary focus is on comboing your opponent and giving them no time to react in time to stop you. This guide will require some time to acquire all the gear necessary, but if you continue to PvP, you will get it all eventually. If you are a Myth level 60-65 and are planning on pvping, this guide can get you to warlord or potentially much farther. However, most importantly: if you’re not having fun, then don’t PvP. It won’t be worth it.